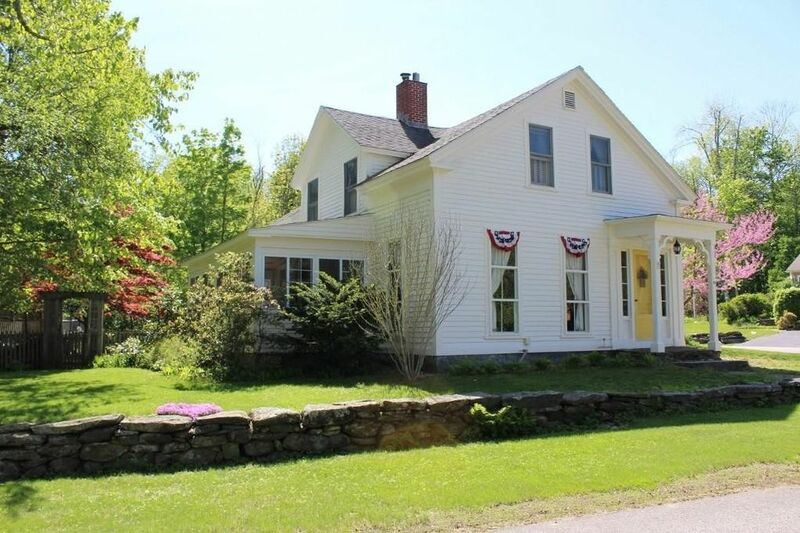 Outstanding Circa 1846 Antique Colonial located on picturesque Broad Street and a short walk to beautiful Barre Common. A very well maintained home and tastefully renovated with modern mechanicals yet all the charm and character of the period. Pretty wood floors include a mix of wide pine, fir and oak flooring throughout the home and the living room with fireplace/wood stove offers a cozy place to spend winter months. The southerly facing sunroom is insulated, has replacement Anderson windows and is heated for year round use and is a great spot to enjoy morning coffee or relax with a book. Spacious front dining room/parlor off foyer with tall windows for natural lighting and a panel covered former fireplace. Kitchen has custom built stainless steel countertop with integral sink along with a separate butcher block countertop work area, built in china cabinet & small dining area. 3-4 Second floor bedrooms with full bath plus 1st floor bath with laundry. Attached garage/barn, deck & yard.